Poison dart frogs are any of the species of frogs belonging to the taxonomic Family Dendrobatidae. 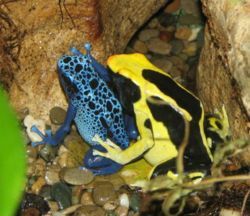 They are also known by several other names including dart frog, arrow frog, and poison arrow frog. These animals have very vibrant colors that cover their entire body. These are believed to be used to ward off predators. The frogs reproduce sexually and produce tadpoles which eventually turn into a frog. They are found in warm, tropical environments, especially Hawaii, and Central and South America. Their diet consists mainly of bugs. They secrete a toxin on their back that is generally harmless to humans and animals, but some rare species, can be extremely deadly. This page was last modified on 8 November 2010, at 14:41.